"Who Is Mermaid Girl?" Part 1 of 2. 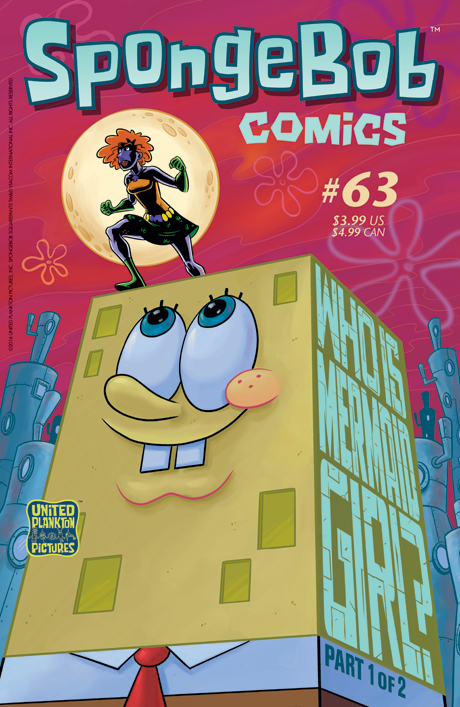 Sandy and SpongeBob set out to discover the identity of the mysterious Mermaid Girl–a plucky heroine who has aided Mermaid Man and Barnacle Boy for years. But first they have to confront the deadly, non-dexterous Hammerhands Shark! Also, Mr. Krabs tricks Patrick and SpongeBob into cutting his mother's terrifying lawn in “Mama Trauma”. Plus: Meet SpongeBob's new imaginary friend–courtesy of your real friend James Kochalka (Quit Your Job)–and check out Patrick's horrifying new look, as designed by David DeGrand (Garfield, Uncle Grampa).